The end of the Middle Ages and the beginning of modern history in Slovakia was connected to its difficult social and economic situation caused by war conflicts such as the Turkish invasion into the Danube Region and by religious disputes between aristocratic followers of the Reformation and the Catholic royal court. For this reason the 16th-century architecture began to turn its attention mainly on the strengthening of towns’ and castles’ defensive capacities. 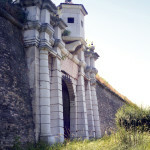 Slightly paradoxically, the Renaissance influence mainly spread through Italian specialists on fortification constructions. Fortifications with massive pentagonal buildings on their corners – so-called bastions – represented fundamental innovation in fortification architecture of that period. 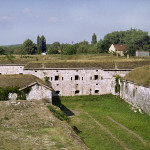 They were applied in the construction of the most crucial fortifications in the Slovak territory – in Komárno and in Nové Zámky. Authorship of the Old Fortress in Komárno is for this reason credited to the significant Italian engineer Pietro Ferrabosco (born in 1512, died around 1599) who probably designed it in 1548. The fortress was built directly on the confluence of the river Danube and the river Váh and this influenced shape of its plan – a slightly flattened star. An example of an optimal fortress’ shape can be found in Nové Zámky. It was built under the supervision of Ottavio Baldigar (? – 1588) in the shape of a regular hexagon with bastions on tops and with a square situated in the middle of the right-angled street network. The Fortress in Nové Zámky – the vision of an ideal fortified city of that period – is considered to be the pinnacle of fortification architecture in the territory of the Hungarian Kingdom. However, Renaissance ideas and a new way of life spread into the architecture in the Slovak territory also by the means of aristocratic building activities such as the reconstruction of their residences according to the latest trends of the 16th century. In this context, the Thurzo noble family deserves our attention. They belonged to the most influential dynasties in the Kingdom of Hungary. Červený Kameň Castle, Orava Castle, Lietava Castle and some of the mining towns that they owned were going through a whole range of modernisation reflecting the family’s entrepreneurial activities. One of the most remarkable examples is the construction of the Thurzo’s residence in Bytča. The fortified Chateau with four cylindrical turrets on each corner was built for Francis Thurzo by the architect John Kilian de Syroth from Milan in the 1670s. 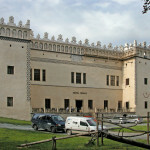 George Thurzo – who inherited the chateau after Francis’ death – gradually reconstructed it into its Renaissance shape. He rearranged the structure of the interiors and enriched the indoor right-angled courtyard with a two-floor open-sided vaulted archway. This gave the courtyard of the Humanistic period an appropriate charm and simplicity. Another of George Thurzo’s crucial actions was the completion of a separate building in the chateau’s glacis – the Wedding Palace. A rather small building with a central hall was built by Italian masters and represented a local reaction to the Italian examples of landscape architecture – summer houses. The rich building’s decorations included indoor murals, facade sgraffitos, mouldings and even representational entrance with a generously decorated portal and an oriel. The chateau in Bytča served as an inspiration for many builders and it is considered to be one of the most extraordinary monuments of the Renaissance architecture in Slovakia to this day. Aristocratic residences which emerged in the Slovak territory in the 16th and 17th century were because of persisting war conflicts, mainly of a fortification nature. 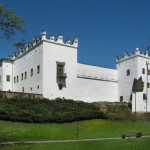 Compact block buildings or four-winged constructions with a small central courtyard were distinctive for their turrets or bastions, by their simple facades sometimes decorated by sgraffitos and by striking crenellated parapets. 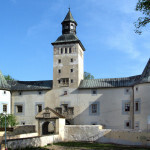 A splendid example of a local Renaissance chateau variation with a courtyard is the Strážky Chateau. On the other hand, the block building-type is excellently represented by the Manor House in Fričovce with a high parapet decorated by a sgraffito. Similar motives, parapets, sgraffitos and arcades were also used in the building activities of townsmen, in the modernization of craftsmen’s houses and public buildings such as town halls or bell towers. In mining towns and in Spiš towns the Italian influence was mixed by German and Polish influences. It is exactly in these towns where the Renaissance motives are still preserved in a relatively compact form. We should mention at least the main square in Levoča and its town hall vaulted by appealing arcades, the bell tower in Kežmarok decorated by a rich sgraffito or the patrician houses of the Thurzo family in Banská Bystrica and in Levoča.